It’s pretty safe to assume that we don’t need a reason to bake pie. We could eat it all day, every day. But if you’re hesitating at all, you’ll be relieved to know today is Pi Day. What is Pi Day you may ask? Pi Day is the annual celebration of the mathematical constant Π. To be a little more specific, Pi is the ratio between the diameter and circumference of a circle. We celebrate this holiday today, on March 14 (3/14), because 3.14 are also the first three digits of Π! Generally, Pi Day is celebrated with pie. Creative right?!? Well… maybe not, but who cares? Not only are pies delicious, but they’re usually a circle too. For us, festivities include activities such as baking pie, talking about pie, eating pie, and maybe even a pie in the face (be careful though, not everyone is a fan of that last one ;-D). 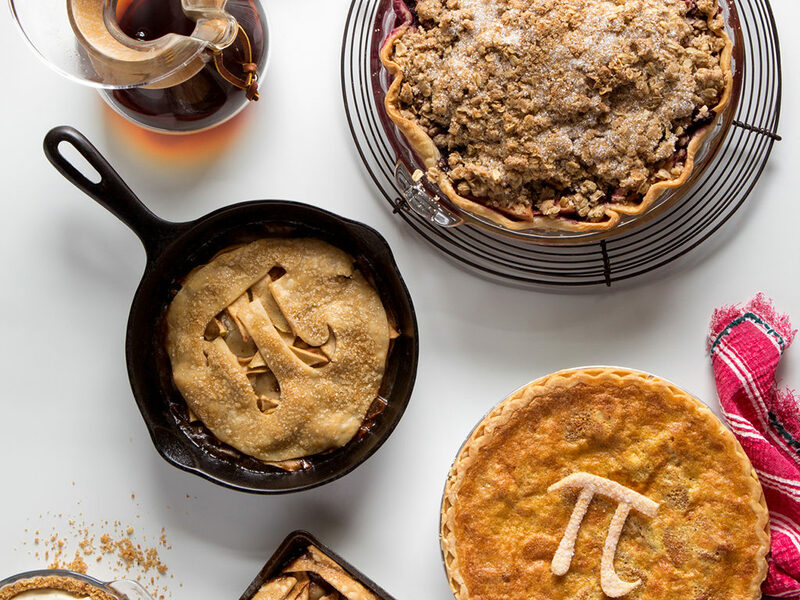 So, like you, we’ll totally use Pi Day as an excuse to get at some scrumptious, pie. This recipe for Apple Berry Pie was concocted by our resident baker and shipping expert Lori. Lori’s Apple Berry Pie is chock-full of apple slices and whole berries: cherries, blueberries, and raspberries. We would say it tastes like an explosion of tart, fruity goodness, but that would not do justice to how good this pie truly is! This Apple Berry pie’s filling is gooey and sweet, with a crumble on top adding a satisfying spicy crunch to the fruit inside. It’s so tasty, we bet you’ll be having a slice for breakfast with your coffee or tea! Give it a try with our March Roaster’s Blend. The combination of piquant Panama Boquete & sweet City Roast Costa Rican coffee perfectly complements the fruity spice of this delectable pie. They go together like two pies in a pod. Give this tasty recipe a try, and let us know what you think in the comments below! Preheat the oven to 350 degrees. Place the pie crust in a baking dish. Toss the apples with the flour and spices and spread in a single layer in the baking dish. Whisk the butter and brown sugar together until smooth. Place the rolled oats, pecans, flour, cinnamon, and salt in a large bowl. Add the coconut oil and brown sugar mixture; stir until combined. Pour the oat mixture over the apples to cover them evenly. Bake for 40-50 minutes until the topping is browning slightly. Let stand for 15-20 minutes. This entry was posted on Wednesday, March 14th, 2018 at 7:03 am	and is filed under Recipes. You can follow any responses to this entry through the RSS 2.0 feed. You can skip to the end and leave a response. Pinging is currently not allowed.